Since the end of World War II, the US has used varying pretexts when embarking on military interventions. The American political scientist Samuel Huntington noted that “power remains strong when it remains in the dark; exposed to the sunlight it begins to evaporate”. Huntington further highlighted that “you may have to sell [military intervention] in such a way as to create the misimpression that it is the Soviet Union you are fighting. That is what the United States has been doing ever since the Truman Doctrine”, announced by president Harry Truman himself in 1947. Huntington wrote the above words in 1981, just as America’s new leader Ronald Reagan was creating his own misimpressions in the self-declared “war against terrorism” in Central America – which quickly became a US-backed terrorist campaign. The Reaganite-sponsored assaults later spread to Asia, the Middle East and Africa, including support for Saddam Hussein‘s Iraq and the South African apartheid regime. Reagan was adept at hoodwinking the American public – from declaring that Sandinista-led Nicaragua was “just two days’ driving time from Harlingen, Texas”, that Grenada, a tiny island in the Caribbean, was “a Soviet-Cuban colony being readied” before US forces invaded “just in time”, and that the Soviet Union was “the evil empire”. A little over a generation before, the Soviet Union had defeated the Nazis largely on their own, losing over 25 million people in the process. These sacrifices have almost been forgotten about in the West’s narrative. The Third Reich was the undisputed evil empire of modern times and, but for the resilience of the Red Army, the world would have been a much bleaker place. Half a century later, with the Soviet Union’s demise, the evil empire pretext could no longer be used by Western leaders when undertaking illegal invasions. In order to continue currying public favor, fantasies were conjured such as dictators possessing stashes of lethal weapons (Saddam Hussein) – or those like Muammar Gaddafi that were simply overseeing a “dark tyranny” thwarting “the aspirations of the Libyan people” who sought “freedom, democracy and dignity”, as former president Barack Obama said. Obama led the way with his March 2011 intervention in Libya, flanked by Britain and France, under the shield of NATO. Gaddafi’s Libya had been the most wealthy nation in Africa, boasting the highest life expectancy on the continent. In the time since, the country has descended into chaos and ruin. The 2018 Human Rights Watch report on Libya states that warring factions there have since “decimated the economy and public services, including the public health system, law enforcement, and the judiciary, and caused the internal displacement of over 200,000 people”. “for more than four decades the Libyan people had been ruled by a tyrant”. 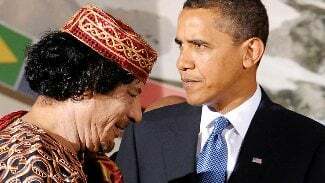 Obama did not mention that Gaddafi’s regime had numerous ties to the US, including close co-operation with the CIA during George W. Bush’s “global war on terror”. In March 2006 – exactly five years before Gaddafi’s toppling – the BBC was describing “Libya’s increasing ties with the West”, and how Gaddafi had “renounced weapons of mass destruction in 2003”. Unlike a certain dictator in Iraq, people were told to believe. In November 2008 a grateful Bush, at the end of his presidency, rang Gaddafi personally “to voice his satisfaction that Libya had settled a long-standing dispute over terrorist attacks, including the bombing of a Pan Am jet over Scotland” (the 1988 Lockerbie bombing, killing 270 people, most of whom were Americans). It was then the first time a US president had ever spoken to Gaddafi – while previously, during his notorious “axis of evil” speech, Bush had not mentioned Gaddafi’s Libya once, while listing off others like North Korea, Iran and Iraq. Just a single person was convicted for the plane’s destruction, Abdelbaset al-Megrahi, a Libyan national and former Libyan Arab Airlines head of security. In late 2008, Gaddafi paid $1.5 billion in compensation, much of which went to US families of the Lockerbie bombing victims. Bush and Gaddafi agreed that this “should help to bring a painful chapter in the history between our two countries closer to closure”. Bush’s White House spokesman, Gordon Johndroe, further said that “the settlement agreement is an important step in repairing the relationship” between the superpower and the north African state. A little over two years later, the Obama administration offered its thanks to Gaddafi by leading the way in ousting and killing him. Furthermore, the US-led NATO bombardment of Libya killed tens of thousands of civilians in the months following the initial invasion. In 2013, Britain’s then prime minister David Cameron said he was “proud” of his country’s role in introducing a “democratic revolution” to Libya. “What I wish to emphasize is that the United States and its NATO allies were never interested in human rights… The empire is now attempting to turn events around to what Gaddafi has done or not done, because it needs to militarily intervene in Libya, and deliver a blow to the revolutionary wave unleashed in the Arab world”. The Arab Spring uprisings began just three months before the attack on Libya. Castro also noted “Libya’s significant and valuable energy resources”. Libya now has the ninth largest oil reserves in the world, ahead of both the US and China. Obama’s concerns for “the urgent humanitarian needs” of Libyans were entirely disingenuous, a smokescreen to avert public eyes from his government’s true intentions, along with its NATO allies. Obama referred to the Arab Spring as those “who rose up to take control of their own destinies” in Tunisia and Egypt, while in secret the West looked on in horror at the revolts. He neglected to say the uprisings never took off the ground in the oil dictator countries the US supports, such as Saudi Arabia. The Saudis’ human rights record has been abysmal for decades, far worse than Iran, for example – but Saudi Arabia remains a long-held ally. As long as the oil rich Kingdom is amenable to Western business interests, human rights issues can be easily brushed aside by government leaders. When it comes to shielding state power from scrutiny, preventing its exposure “to the sunlight”, Obama breaks all records. He punished more whistleblowers than all previous US presidents combined, and introduced various legislation (like the 2012 National Defense Authorization Act) that was a severe attack on civil liberties. What’s more, there was his international drone assassination campaign, which often targeted those simply suspected of being a terrorist (with many civilians also being killed) – an extreme violation of Magna Carta and presumption of innocence. This method of warfare only serves to spawn new terrorists and other enemies. Worryingly, the Trump administration has since stepped up drone usage, conducting numerous attacks in places like Yemen, Pakistan, Libya and Somalia. Shane Quinn obtained an honors journalism degree. He is interested in writing primarily on foreign affairs, having been inspired by authors like Noam Chomsky. Shane is a frequent contributor to Global Research.